Your pig with lipstick is still a pig. Just because you have 356 different social media, web 2.0 accounts and services where you post for advertising your brand, doesn't mean your company stands behind you. In an era of instant on, we also have instant feedback expectations. As an example, I discuss business uses of social media but when I ask about the execution of the services side, usually you hear, of course we expect the best from our people or some other similar line. Now it is all very nice for marketing and the executives to say they want to use all of this, but what about the front lines people? The ones that actually have to see, speak, touch or help real people? How does this help? The usual complaint is the executives are not on Twitter or use someone/something else to post for them. Who cares about that, why is this any different than a weekly newsletter they don't write? But the front lines get it, or so you think. What they get is you have opened the flood gates to any site someone wants to join. This is a great thing, but getting the employees to use it for business is hard. They use these programs for their benefit usually and sometimes for business. As I am writing this at the PACLUG and The View Admin conference in Las Vegas, I pondered what if housekeeping was on Twitter? What about the bartender? Valet? As it turns out they are on Twitter, someone from the hotel and they respond fairly quickly. So kudos to them. Is this the new customer service/ What if you could Tweet to these people? Would they respond to your needs efficiently or properly? 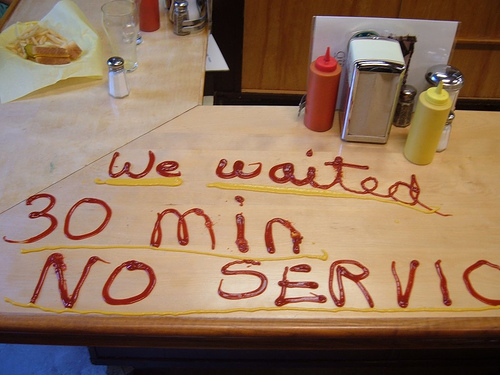 The premise of Social Business is to be more interactive and engage the customer....but what if your front line customer service is not so great? Case in point, my hotel room had 1 hanger. Presumably the hotel has a checklist that Housekeeping follows and my guess is a previous guest helped themselves to some hangars. There was 1 which held the laundry bag and list of services, so I know Housekeeping was there, but I would think they would make a note to get more hangars to the room. This is where Social Business gets hurt, because what if I or you started ranting on Twitter or a travel site? People don't take the time anymore to go through proper or usual channels, they just want to tweet or ping someone and get instant help. Social Business should be an extension of customer service in a natural way. Yet, that is not really how it is working in every organization. Make the effort to be prevalent across the board so everyone is part of the solution. Social media is being used as a shortcut but there is no shortcut to great customer service.